The Finance Ministry admitted Monday that it altered documents related to a suspicious land sale that sparked allegations of favoritism that have been dogging Prime Minister Shinzo Abe for over a year. The complex scandal appears to have dented Abe’s popularity as he attempts to win re-election as head of the ruling Liberal Democratic Party in September and thus remain prime minister. The scandal centers on the 2016 purchase of a plot of state-owned land in the city of Osaka by the operator of an ultraconservative kindergarten. The school, Moritomo Gakuen, reportedly paid just ¥134 million ($1.3 million) for the 9,000-sq.-meter (97,000-sq.-foot) plot — around a tenth of the price for a comparable spot nearby. Why is it damaging for Abe? The school’s operator, Yasunori Kagoike, claims ties to Abe and his wife, Akie, and the opposition alleges the cut-price deal was sealed due to Kagoike’s high-level connections. Kagoike claimed he received a ¥1 million donation from Abe via his wife for the school — which the prime minister strenuously denies. Akie Abe, who visited the school to give a speech, was named its honorary principal but stepped down when the land scandal swirled. 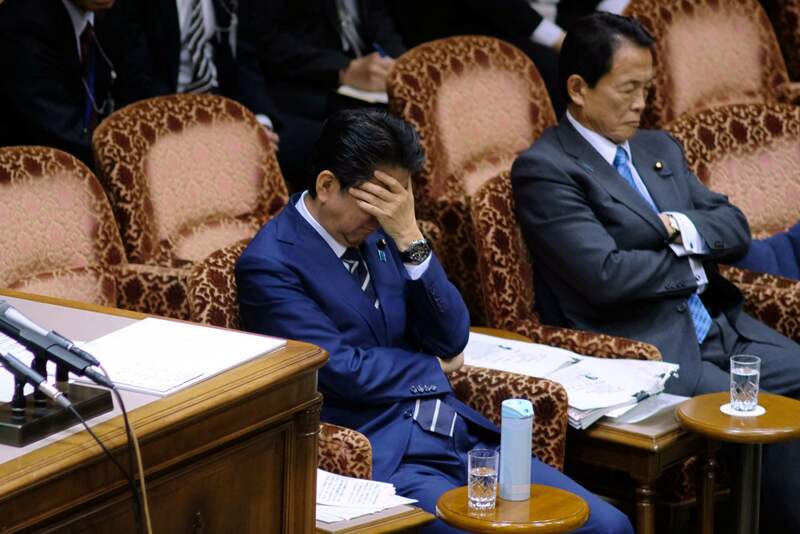 The scandal appeared to have died down after Abe called a controversial snap election last year that he won with a resounding majority despite opposition efforts to raise the issue during campaigning. But earlier this month, the daily Asahi Shimbun reported that documents relating to the land sale had been altered before distribution to lawmakers. Details including the names of several politicians were deleted from the documents eventually presented to the Diet, reports have said. Among the names removed from the documents was that of Akie Abe, reports said. Nobuhisa Sagawa, head of the National Tax Agency, quit last week over the scandal, with some reports suggesting he ordered the redactions. A Finance Ministry official involved in the scandal was found dead last week in an apparent suicide, although it is not clear whether there is a direct link. Abe has remained largely free of the scandals that afflicted previous prime ministers, but his popularity already seems to have taken a hit. For the first time since he won re-election in October, the most recent poll shows his approval rating has fallen below 50 percent. How damaging is this for Abe? Despite an apparent blip over the scandal, Abe enjoys approval ratings that would be the envy of British Prime Minister Theresa May or U.S. President Donald Trump. Opposition to his LDP-led government remains fragmented and weak, and Abe has a two-thirds supermajority in the Diet that gives him a powerful base. Abe is seeking re-election as head of the LDP in September, and a win would set him on course to become Japan’s longest-serving leader. For the moment, no challenger has emerged, but the scandal could damage Abe at a time when the hawkish leader wants to make contentious changes to the Constitution while dealing with the North Korea nuclear crisis. 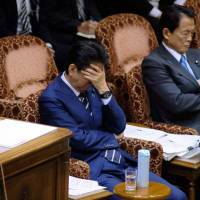 “Abe’s situation could become more precarious if his approval ratings begin to fall again. In this case, it would create space for a rival to argue that a scandal-weary public is ready for change,” said Tobias Harris, vice president of the Teneo Intelligence think tank. Pressure is also mounting on Finance Minister Taro Aso at a time when the world’s third-largest economy is enjoying its longest run of growth since the bubble days of the 1980s.